Looking for a logbook loan for a car older than 10 years? Varooma offer logbook loans for older cars. Apply now for one of our loans below. Varooma's loan contracts start from 12 months to a maximum term of 36 months. You are entitled to settle your loan early and there are no penalties or charges to do so. It is common to be turned away from many logbook loan companies if you are looking for logbook loans for cars older than 10 years. However at Varooma we are happy to offer a loan to you if you have an older car. We will not simply turn you away before you even begin your application because your car is over a certain age. We look at each application individually and base our lending decision on your car, as well as the affordability of the loan for you. We offer loans for bad credit so even if you have a poor credit score, we may still be able to lend to you, as long as you meet our criteria. Having an older car does not mean that you aren't able to secure a loan against it. The vehicle will obviously still have some value and you may be able to borrow money based on that. The amount you can borrow will depend on a number of things such as how old the car actually is, the mileage on the car, and it's trade value. We also take the condition of the car into account when you make your application. Obviously the better the condition of the car, more likely you will be to secure a loan against it and the higher value it will have. The best thing to do is apply, and we will be able to make a decision. It will also depend on how much you can afford to pay back. We take all of these factors into account when you apply for a loan. In most cases it is a quick and simple process and you will generally receive your money on the same day you make your application. What type of car will you loan against? We can loan against many types of car and will lend money against prestige and classic vehicles. Again it depends on the specific car you have and it's condition, mileage and trade value. Every car is different and we will base our decision on your car individually. We believe that people looking for logbook loans for older cars should have the ability to take out a loan in a very similar way that you would if you were borrowing against a car that was less than 10 years old. For you the process of taking out the loan will be very similar to what it would have been if you were applying for a loan against a newer car, it is just at our end that we may conduct a few extra checks. Why treat older cars differently? When you take out a logbook loan, the lender is using your car as security for the loan. This means that should you never pay your loan back your car is at risk of being repossessed. The lender needs to make sure that the value of the loan you are taking out is covered by the value of your car. Older cars are normally less valuable than newer cars so lenders have to be careful that if you should not pay back the loan and they were to sell your car after repossessing it, the amount they make back would cover your initial loan. Is there and age limit for my car? We don't set limits on the age of your car because each vehicle is different and we lend based on the individual criteria of your car and your ability to afford the amount that we can lend. In general it is more likely that we will be able to lend more to owners of vehicles that are less than 10 years old due to the higher value of these cars. However just because your car has a high value doesn't mean that we can lend you more money, we will also look at how much you can afford to pay back. If you can't afford to pay back the loan then we won't lend the money to you, even if the value of your car is high. Why choose Varooma for your logbook loan? We have the highest customer satisfaction rating out of any other logbook lender. 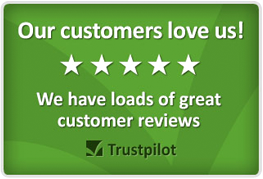 With well over 1800 customer reviews and the majority of them rated excellent, we can offer you a service that has been used by thousands of happy customers. We provide no guarantor loans, meaning that you don't need anyone else to sign your loan agreement. It is entirely confidential and we don't simply refuse you based on your credit history. We look at how affordable the loan is for you and the trade value of your vehicle. Varooma offer some of the best interest rates on the market today and we can lend you the money on the same day as you apply, very often within a few hours of you making your application. We are always happy to answer your questions so please feel free to contact us on 0330 440 0101 if have anything you would like to ask or would like to make an application. You can also apply here.